for your organization, congregation, or school. 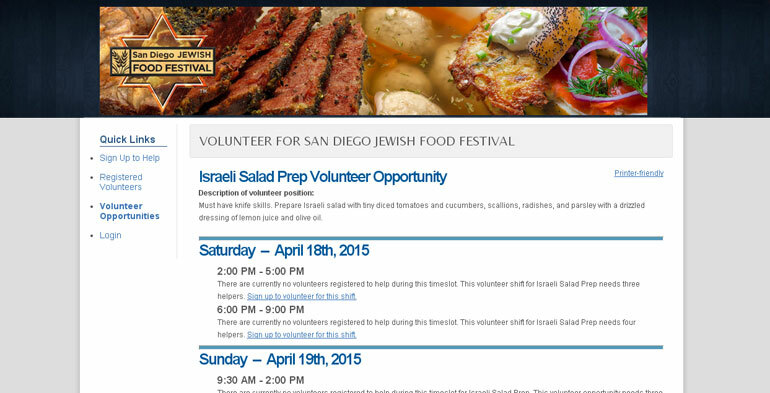 focus on the event instead of scheduling volunteers. Custom website maintains your brand. 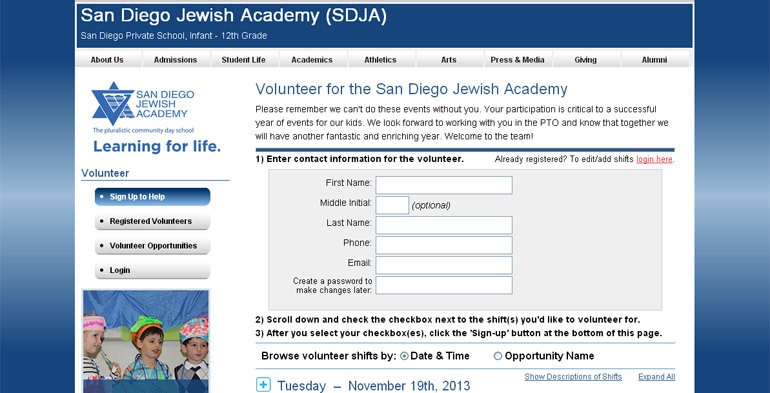 "Aaron created a sign up web site for a conference in San Diego. 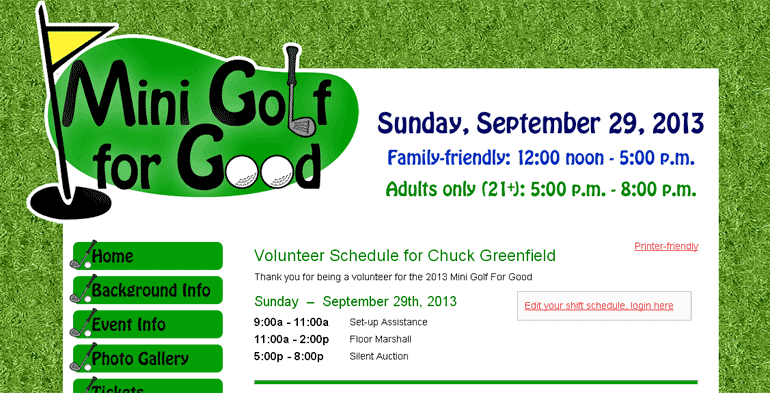 We needed 800+ volunteers and the Sign Up Online platform streamlined our system. The end result was a very efficient list with all the data we required in one simple operation. The platform eliminated hours of work on our side because it was so well organized. I'd do it all over again using this system." 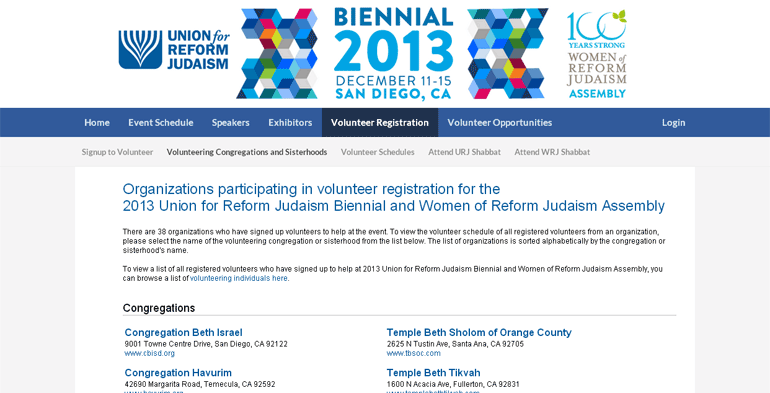 "SignUpOnline was great for our volunteer sign up for the 2013 URJ Biennial. It was user friendly for both those signing up and those managing the system, and allowed us to keep track of over 800 different volunteer shifts. Aaron was always quick to update the system and make changes as necessary, and was very easy to work with." "Aaron created the perfect program for anyone looking to coordinate any number of volunteers for a project. We've used him for multiple events, coordinating over 300 volunteers for a one-day event and also coordinating 800 volunteers over a four-day event. Both times, he was amazing to work with, personalizing and customizing our site to fit our needs exactly. He was so easy to work with and incredibly accommodating - we will use him again in a heartbeat!" "Everyone who has signed up on Sign Up Online has said how easy the process has been. We have been very pleased with Aaron's work now as well as in the past. 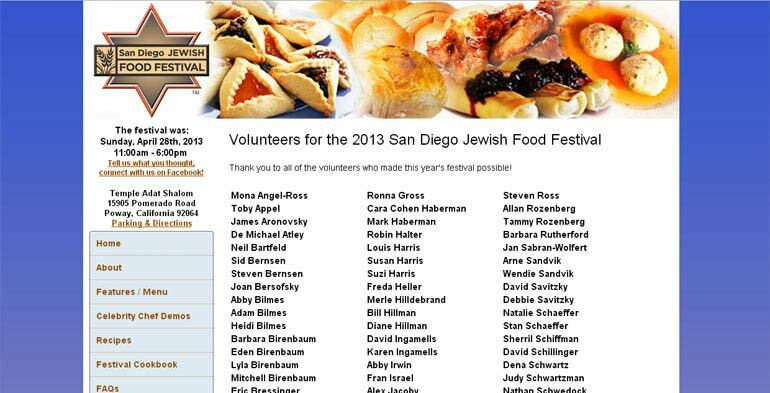 I have also worked on the Jewish Food Festival with Aaron." "Aaron provided our congregation with services involving the set up and maintenance of a web site for our food festival. This involved multiple revisions and updates. 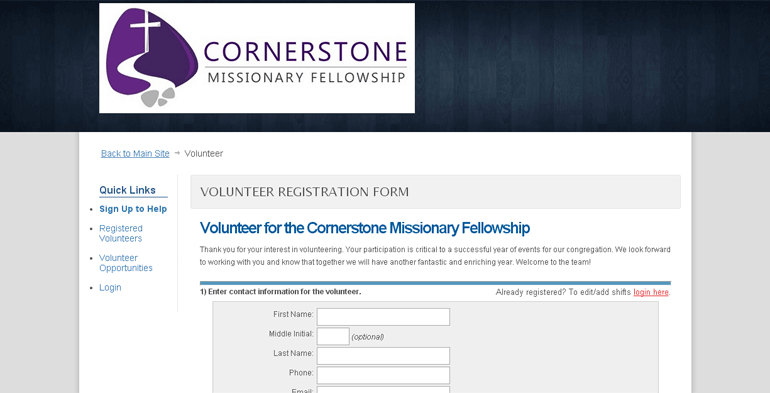 He also set up and maintained a complex volunteer sign up site and an on-line payment process. His work was timely and effective. He is a real professional." "In an effort to streamline our school's parent-teacher volunteer sign up process, our PTO President turned to Aaron for help. In a short period of time Aaron created a rather remarkable sign up page on signuponline.org matching the design of our school's website. By doing so, he has allowed our volunteers an easy route to view events and volunteer opportunities and to sign up - all without anyone realizing that they have left our website! And when we had some changes to our main web page, Aaron was quick to edit his page to reflect the changes. I wish working with outside vendors was always this easy!" "We were looking for a better solution to help us manage our volunteers. Aaron was very instrumental in helping create an easy and efficient online volunteer signup platform for our private K-12 day school’s Parent Teacher Organization. Aaron developed a very professional customized website that automated the process and took the pain out of managing volunteers on an ongoing basis. He went above and beyond to make sure it was the best solution for the school and PTO. 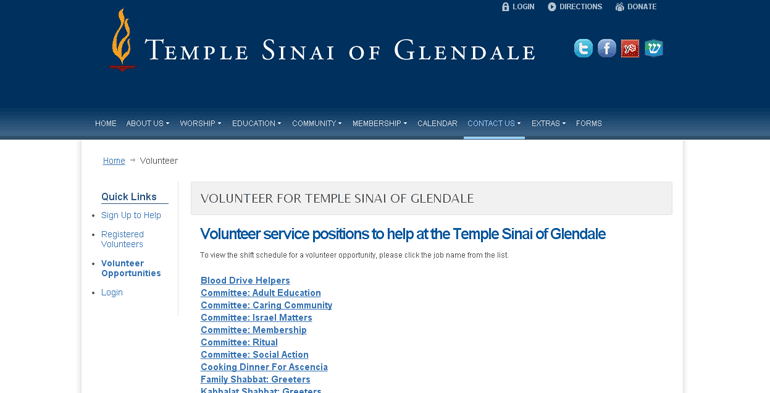 I would highly recommend SignUpOnline.org for anyone’s volunteer coordination needs." "Aaron is a detailed oriented individual who assisted our charitable organization by developing a user friendly ecommerce interface for our website that increased pre-event paid registration by over 1000 percent. I highly recommend him." "Sign Up Online is AMAZING! We were able to coordinate over 300 volunteers for an event so easily - no one was confused and volunteer check-in was a BREEZE!! THANKS!!" SignUpOnline.org is a turnkey volunteer registration and management platform enabling organizations to eliminate the headaches of coordinating multiple volunteer schedules. 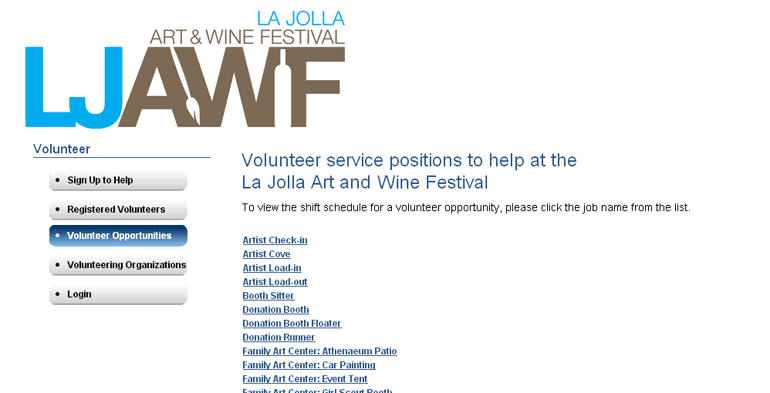 Thru a custom branded website, volunteers can self-register directly for the specific shifts of your organization's upcoming events. A completely flexible solution, the platform has been proven to make volunteer signups an ease, whether a small event of a dozen shifts and volunteers, to large multi-day conferences with hundreds of shifts, upwards of 1,000 volunteers.